Ah, November! 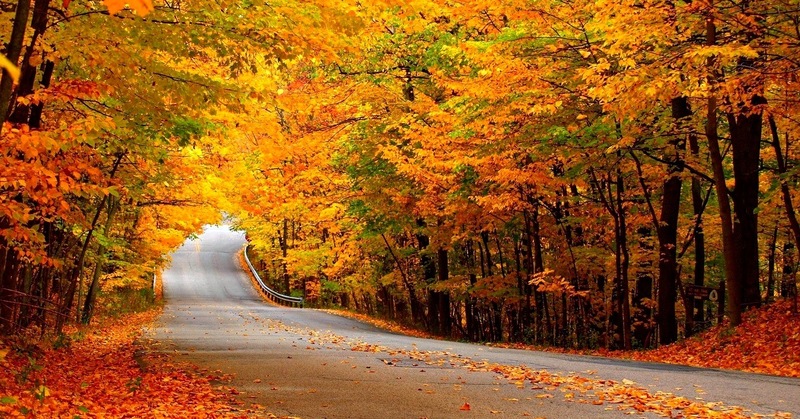 Harbinger of cool, crisp mornings, rusty autumn leaves, and the sweet aroma of fresh pumpkin pie. For UT students, November is a blur of mid-term exams and research projects, interrupted by Longhorn football on weekends. While the spring semester is neatly divided with a week-long pause in the middle, the fall term marches on relentlessly until the much-appreciated Thanksgiving break at the end of the month. Of course, when Thanksgiving finally arrives, most students can’t wait to evacuate the campus. But not everyone – usually out-of-state or international students – gets to go home for the holiday. Though on-campus residence halls remain open, the break is a holiday for the kitchen staff, and the cafeterias remain closed. Above: The Beauford T. Jester Center residential complex. 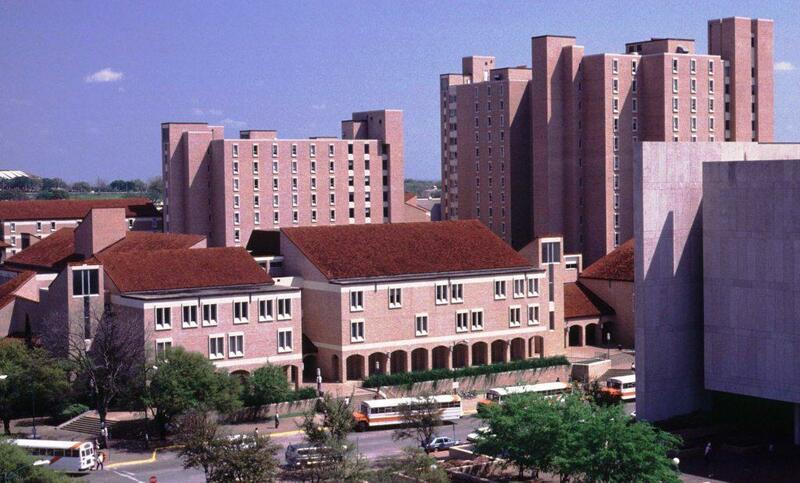 On the right is the 14-floor Jester West, while the shorter, 10-floor Jester East is to the left. And take a look at the old-time UT shuttles parked in front – orange and white painted school buses! In the 1980s, the Divison of Housing and Food wanted to ensure all students living on campus had an opportunity for a traditional Thanksgiving, and served a complete feast about a week before the holiday. The cafeteria in Jester Center, the largest on campus, went all out: table cloths, candles, full turkeys carved by the staff, dressing, plenty of healthy vegetable sides, and pumpkin pie for dessert. The cutouts of pilgrims taped to the windows might have looked a little cheesy, but the effort was appreciated by everyone. 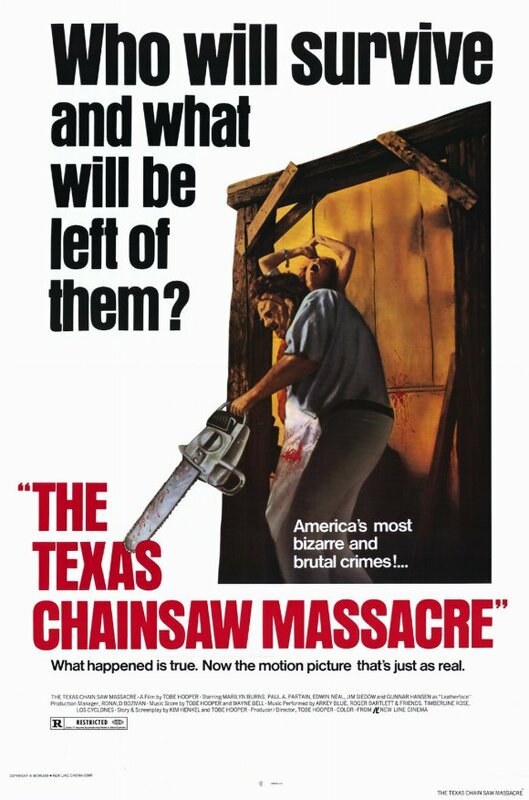 Above: Ad in The Daily Texan – Last night for the Texas Chainsaw Massacre! One year, the Thanksgiving meal happened to coincide with a dollar movie showing of the Texas Chainsaw Massacre at the State Theater on Congress Avenue downtown. A holdover from Halloween, it was the final night to see the horror classic. Among the freshman residents of the famed 12th floor of Jester West, Sharon – we’ll call her “Sharon” (because that’s her name!) – had recently become a great fan of scary films, but hadn’t yet witnessed the Massacre. After the Thanksgiving dinner, she recruited a couple of friends and went to see the movie. 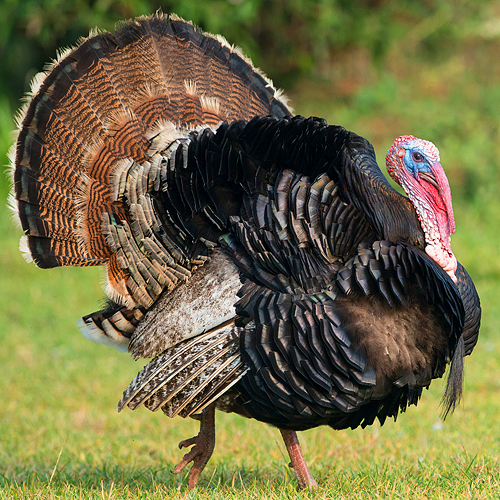 While Sharon was at the film, a mischievous student (or students) paid a visit to the trash bins behind the Jester Center cafeteria and procured one of the leftover turkey carcasses. The identity of the person has never been discovered, though it’s rumored to have been a resident of the 14th floor, which was then well-known for harboring trouble-makers. To hear more, a study break was called, and the group decided to raid the Jester snack bar, a tiny, makeshift store then located on the ground floor. Everyone headed for the elevator lobby as Sharon pushed the call button. Unbeknownst to anyone, the mystery student who’d acquired the turkey carcass had decided to hang it from the ceiling of one of the Jester Center elevators. As an added touch, a thick, frayed rope was used, and all but one of the fluorescent lights was removed. The remaining bulb was twisted so that the connection was erratic, and the light blinked eerily. Ding! The elevator arrived. The door opened, and Sharon was to be the first to step inside. It’s unlikely the prank was intended for Sharon, or that the turkey was hung as a nod to the Texas Chainsaw Massacre, but the combination of events could not have been brought together any better. The view inside the elevator: what was left of a once noble bird now dangling from a tattered rope, swinging slightly, dripping a little on to the floor, and illuminated by a faint, intermittent light, was a scene from the Massacre come to life. It was too much for Sharon and her goose bumps, who let out a a scream never heard before or since as she sprinted down the hall to the safety of her room. No more was said to Sharon about the movie that evening, but the eats at the Jester snack bar were fine.